Last year one of my friends posted a picture of her Passover preparations with the comment: "slaves in mitzrayim (Egypt), now slaves in the kitchen". Passover has some of the most difficult holiday preparations, but the hard work comes with great reward. Every year we remind ourselves of the foundation of our people, the themes of oppression and liberation. All of the hard work does take its toll but when everything is ready and we&apos;re finally at the seder, we can truly begin to understand the feeling of liberation. That being said, the key to Passover preparations is organization and planning. 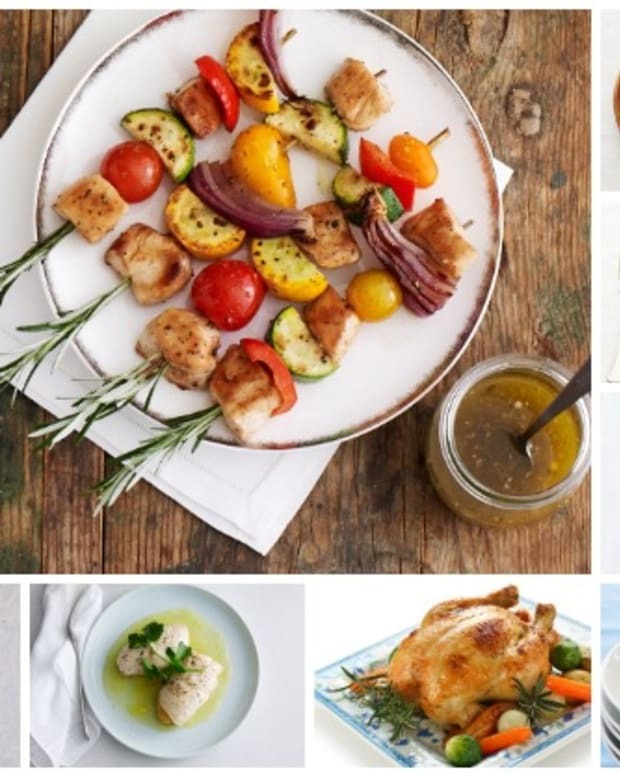 With so many meals to organize it makes it that much easier to have all of your go-to recipes in one place, which is why here at Joy of Kosher we wanted to present a thorough list of of some of our best recipes. 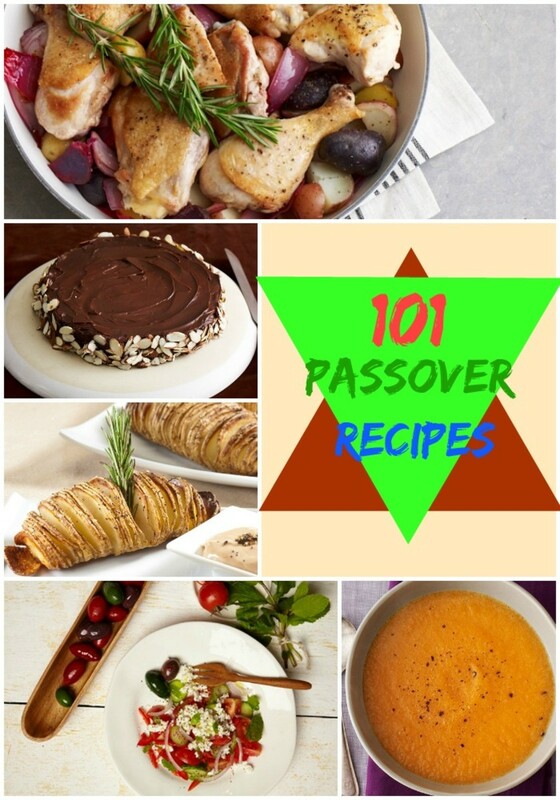 Below are 101 Passover recipes, if you would like more ideas please check out the rest of our Passover ideas here. Don&apos;t restrict yourself only to the hard-boiled egg on the seder plate! Eggs can be transformed into a number of recipes that are great for any meal. 1. 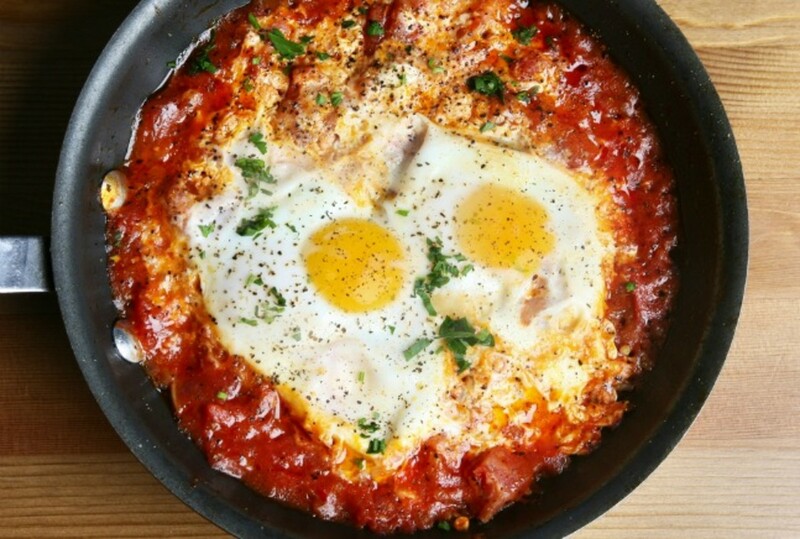 Shortcut Shakshuka: Shakshuka is incredibly versatile and can be customized to anyone&apos;s preference. Be sure to checkout Jamie&apos;s video on how to make delicious shakshuka with minimal prep and clean up time. 2. Fines Herbes Whipped Cream Cheese Omelet: A fluffy omelet is an easy, delicious meal at any time of day. It can easily be served to large groups as well as small, and customized to each persons tastes. 3. Chinese Deviled Eggs: Save the classic deviled eggs for seder plates, and try these Chinese deviled eggs which get their flavor from a mix of mayo, ginger and Passover soy sauce. 4. Baked Eggs with Sausage and Sweet Potato Hash: Hearty breakfast or satisfying dinner this is a one pot meal. 5. Grandma Sylvia&apos;s Salmon Croquettes with Fried Onions: These croquettes are a satisfying snack or can be made into a meal by serving with soup and salad. Make these non-gebrokts by substituting potato starch for matzo meal. 6. Salami and Eggs: The salami is lightly fried in oil meanwhile the eggs are cooking. The recipe calls for scrambled eggs, but prepare them however you prefer. 7. Pesto and Roasted Red Pepper Deviled Eggs: Another great deviled eggs recipe, this would be wonderful paired with a hearty salad. 8. Vegetable Egg Crepes: Thin egg crepes pillow a colorful stack of peppers for a tasty, visual pleasing breakfast or brunch entree. 9. Egg White Frittata with Tomatoes, Spinach, Mushrooms and Goat Cheese: As the saying goes: everything but the kitchen sink (and the chametz!) can go into this egg white omelet. 10. Omelet Roulade: A perfect way to feed a large group, the omelet cooks quickly and easily in the oven leaving you to enjoy your guests. Liven up salads with bold colors, flavors and unexpected "croutons". Salads can be transformed from a side dish to a main entree by adding protein or serving it up in a gorgeous dish. 11. Goat Cheese Salad Croutons: Turn an arugula salad into a show-stopping dish with these goat cheese croutouns. 12. Chopped Broccoli Salad:This mayo-free recipe is not only rich and creamy because of the avocado, but also has this nice crunch of sliced almonds. 13. Spring Lettuce Salad with Pastrami Croutons: A passover friendly take on a pastrami sandwich, this healthy salad will satisfy any meat-lover. 14. Shaved Mustard Green Salad: Mustard Greens are a fun twist on traditional lettuce salads, they add an extra punch of flavor that is highlighted with a simple vinaigrette. 15. Rainbow Salad: All of those colors serve not only to brighten up the plate, but also are full of vitamins. Use carrots, beets and kohlrabi or substitute your vegetables of choice. 16. 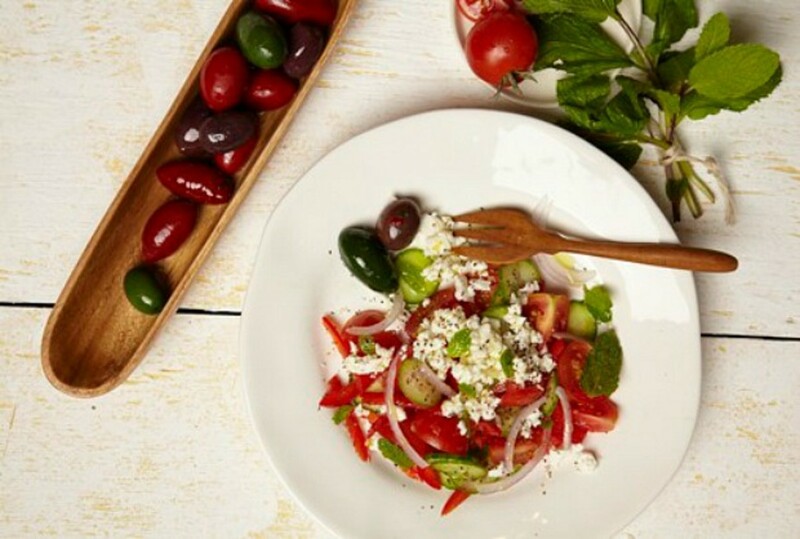 "Beefed-Up" Israeli Salad: This salad is "beefed-up" not in the sense of adding meat, but by taking the traditional Israeli salad and adding feta cheese and mint leaves for a satisfying twist. 17. Fennel-Orange Salad with Lemon Vinaigrette: Fennel and citrus are a delightful mix of sweet and tangy flavors. 18. 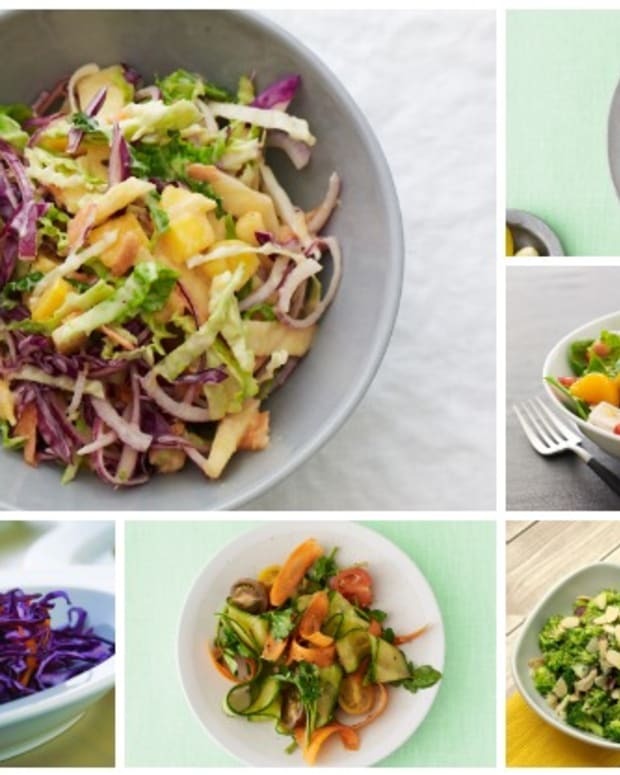 Tropical Slaw: This delightful mix of citrus and and cabbages would be a great accompaniment to fish. 19. Creamy Kale Salad with Capers and Hazelnuts: Kale, capers, hazelnuts and host of other ingredients compose this well-built salad with a multitude of flavors and textures. 20. Pomegranate Salad with Berry Vinaigrette: This salad is packed with the bright refreshing flavors of pomegranate and complimented by balsamic and berry vinaigrette. 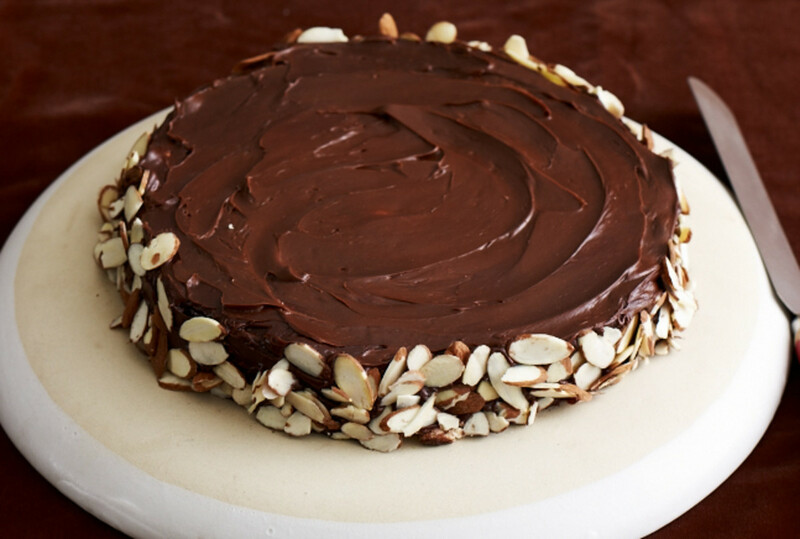 Passover is great time to be creative and transform your favorite dairy recipes. A dairy lunch or dinner can be very refreshing the day after a heavy seder meal. 21. Baked Goat Cheese with Ricotta and Sweet Roasted Tomatoes: Consider it a soufflé without the chametz! 23. Parmesan Crisps: Add these cheesy crisps to transform a simple salad, or try the crisps as a salty, creamy snack! 24. Cheddar and Potato Latkes with Spiced Applesauce: Most people wouldn&apos;t associate latkes with Passover, but the addition of cheddar and spiced applesauce make traditional latkes into a savory, comforting dish. 25. Eggplant and Portobello Sauté with Temp Tee-Avocado Crema: This dish is sure to delight meat lovers and vegetarians alike. The portobellos have a meat-like heaviness which plays well with the cream cheese avocado cream sauce. 26. 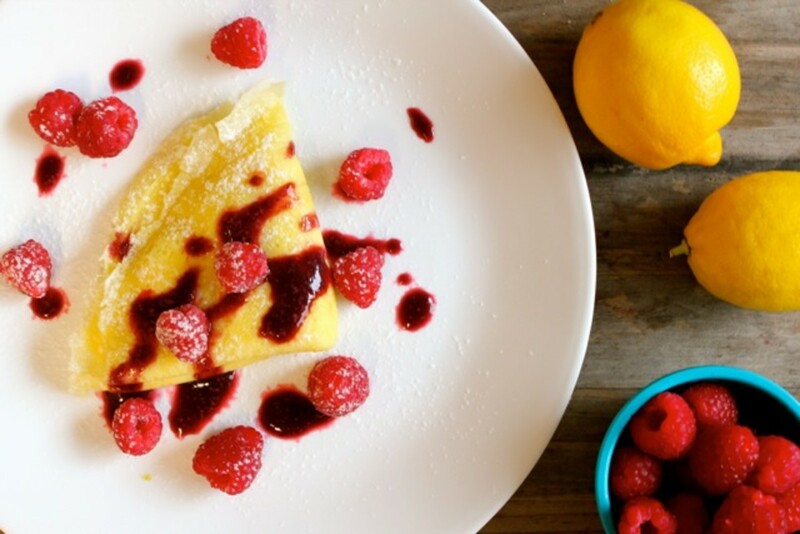 Lemon Cream Cheese Gluten-Free Crepes with Raspberry Sauce: By substituting potato starch for flour, these crepes are kosher for Passover and a surprising treat for gluten-free family members or guests. 27. Passover Enchiladas: This gebrokts recipe which mixes some south of the border flavor with Passover festivities. 28. Eggplant Roll-ups: Simple ingredients lead to delicious results! An easy, family friendly meal that works for lunch or dinner. 29. Herbed Cheese Spread: Whip this recipe out whenever you need to add a flavorful pop to roasted vegetables. 30. Passover Jalapeño Poppers: These spicy, fun poppers make a great snack and would be great to take on a Passover Picnic. Potatoes are a Passover staple which exemplify just how easy it is to elevate a simple ingredient. Even though it is a noble cause to try to limit the intake of this simple starch, here are a few potato recipes in case you choose to serve them at every meal or only a few times during the holiday. 31. Spanish Potatoes with Roasted Tomato Cream Sauce: Despite the creaminess, this potato dish is parve. The sauce gets its texture from a mixture of tomatoes, mayo and a splash of balsamic vinegar. 32. Horseradish Potato Kugel Muffins: Transform classic potato kugel by baking it a individual muffins with the tang of horseradish. 33. Warm Potato Salad with Horseradish Sauce: Try serving classic potato salad warmed up with a spicy horseradish sauce. Consider adding haricot verts for an added crunch. 34. Fingerling Potatoes with Creamy Tarragon Sauce: The savory cream sauce can be made parve by substituting cream cheese with your choice of nut or soy milk and and margarine or nut butter. 35. Loaded Baked Potato: A go-to dinner for the interim days when you&apos;re either tired (but elated!) from going on chol ha&apos;moed trips or as break from your cooking preparations for the last fews days of yom tov. 36. Patatas Bravas with Aioli: A classic dish from Spain make an easy and delicious side during your Passover festivities. Try serving it with dipping sauces as a way to add a little extra excitement to this simple, yet magnificent dish. 37. Crispy Squashed Potatoes: An unbelievably easy dish to make, yet so versatile. If you&apos;re not serving meat, try topping the squashed potatoes with sour cream. 38. Pastrami Latkes with Sweet-Chili Mayo Sauce: Pastrami and latkes, two traditional Jewish foods combined into a super tasty hand-held treat topped with spicy sweet sauce. 39. Creamy Smashed Potatoes with Chives: Serve these with salmon or soak up the juices from brisket with these easy, delicious smashed potatoes. 40. 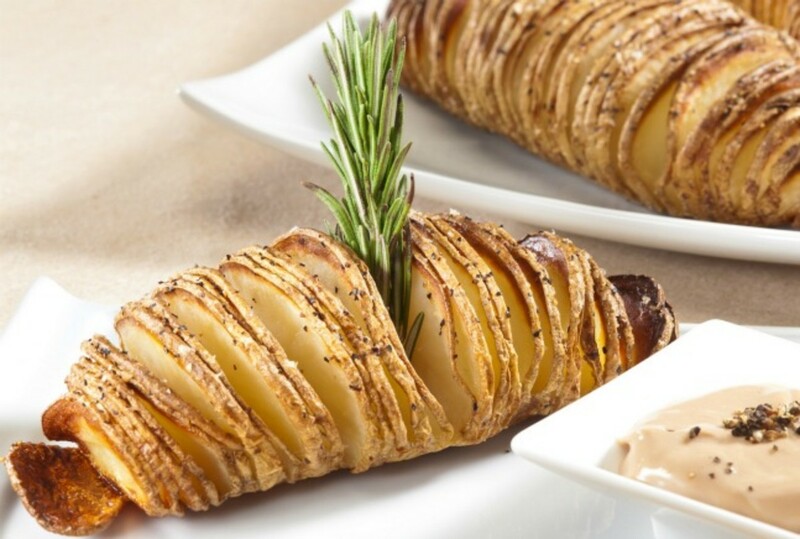 Hasselback Potatoes with Balsamic Mayonnaise Dipping Sauce: These accordion-style potatoes are topped with a delightful sauce of balsamic mayonnaise. 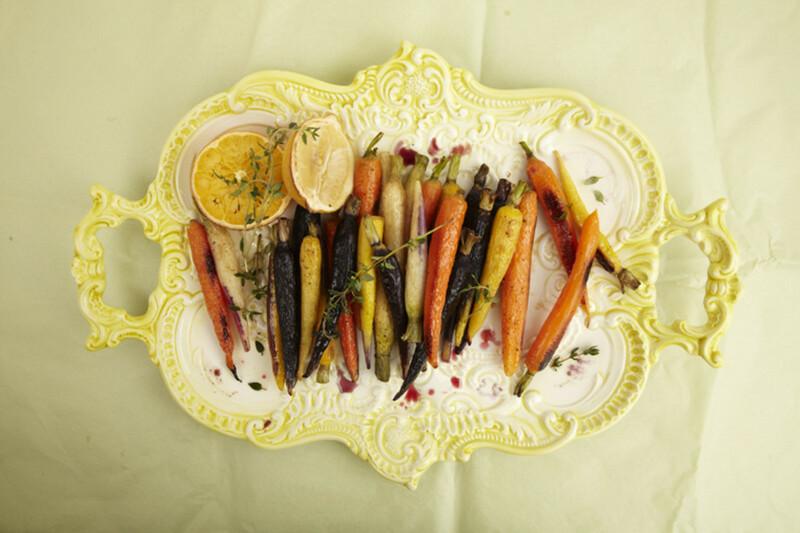 I learned recently that some families have the tradition of eating a vegetarian seder so as to not detract from the korban pesach, the shankbone on the seder plate. 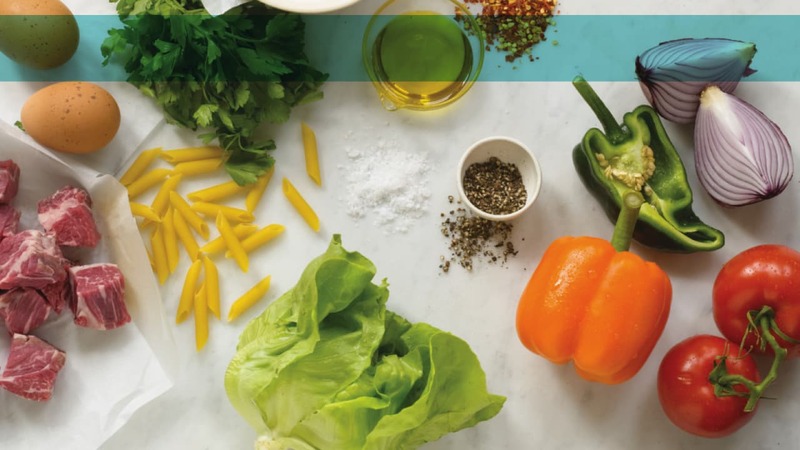 Either way, having a plethora of vegetable sides for the seders and throughout the week will make everyone happy, and maybe distract them from their craving for pizza or a bagel! 41. Eggplant Tomato Stacks: we may not eat leavened wheat on Passover, but feel free to stack as many fried eggplant or tomato slices as tall as you like. 42. Colorful Cauliflower:Roasting vegetables must be one of the easiest, most delicious ways to prepare vegetables. Adjust the seasoning to your preference or substitute to cauliflower with your vegetable of choice. 43. Sabra Moroccan Carrots: This carrot salad packs plenty of flavor with help from Sabra Turkish Dressing. If you don&apos;t eat processed foods on Passover, make your turkish dressing by checking out Sabra&apos;s ingredient list here. 44. Zucchini Fritters with Fresh Tomato Salsa: Fritters transform every vegetable into a fun and tasty treat for kids and adults alike. 45. Citrus Glazed Roasted Carrots: The carrots caramelize beautifully in the oven with the help of a few bright flavors such as orange and lemon. 46. Veggie Liver Stuffed Mushrooms: Sabra produces their spectacular veggie liver on for Passover. Try it with mushrooms to create a satisfying vegetarian appetizer in with less than five minutes of prep time. 47. Balsamic Roasted Mini Peppers: This would be a great side to accompany any red meat dish, such as the Kosher Braciole Skirt Steak below. 48. Brigitte&apos;s Spaghetti Squash: Even though we don&apos;t eat traditional pasta on Passover, satisfy your noodle craving by preparing squash or zucchini as you would pasta. 49. Beet Tzimmes: This light and refreshing take on the classic tzimmes makes a wonderful vegetable side dish. 50. Roasted Summer Vegetables with Horseradish Aioli:Spruce up your favorite combination of vegetables with a spicy horseradish aioli. Fresh fish is a great way to create a healthy, kosher for passover meal. A little salt and a bit of dressing transform fish into an impressive and satisfying meal. 51. Smoked Salmon and Herbed Cream Cheese Cups: An impressive display and a creative take on lox and cream cheese makes these cucumber cups a must serve. For a parve version substitute with non-dairy cream cheese. 52. Baked Horseradish Gelfite Fish: The great thing about gelfite fish is that it comes pre-made kosher for passover or can easily be made at home with your choice of white fish. 53. Steamed Cod and Sun-dried Tomato, Olive Tapenade: This name of this recipe not only sounds super healthy, but it&apos;s also delicious and sasifying. Steamed cod has a light, refreshing flavor while the sun-dried tomato and olive tapenade are rich in color and flavor. 54. Salmon with Kale and Yogurt Horseradish Sauce: The yogurt horseradish sauce provides a creamy and tangy flavor to the delicate flavors of the salmon. 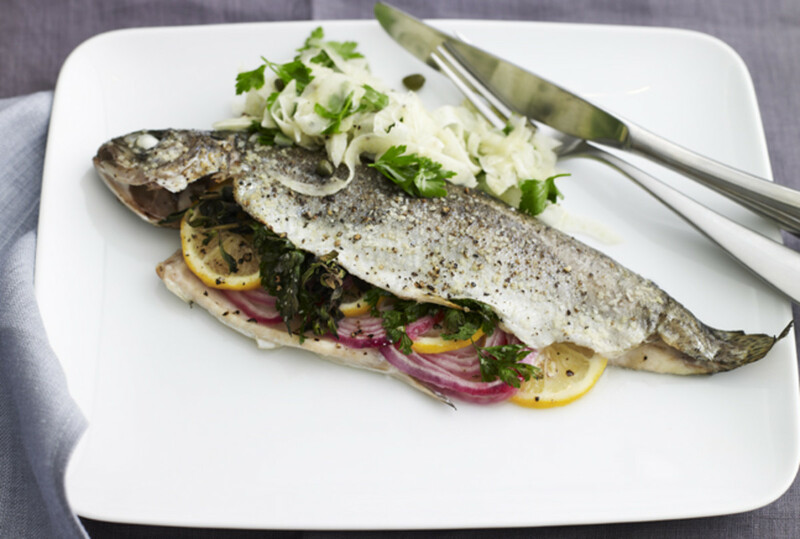 55.Roasted Branzino with Citrus and Caramelized Fennel: Branzino is one of my favorite fishes. It is so simple to prepare and is always delicious. 56. Ceviche with Pickled Beets and Creamy Avocado: Each South American country has their own distinct approach to the ceviche. For Passover use the basic ceviche as a foundation for building a unique dish. 57. Smoked Salmon and Dill Spread: This is one great dip to spread on matzo. If that&apos;s not your custom, serve a dollop of this spread on your lunchtime salad for a satisfying meal. 58. Nut Crusted Salmon with Creamy Chrain Sauce:This salmon could easily served as either a first course or a main dish. The pistachio crust and chrain sauce are major wow factors bound to dazzle your guests. 59. Peppered Tuna with Wasabi Mayo: A high quality ingredient does not need much to accompany it. The combination of tuna and wasabi mayo is both refreshing and tangy. 60. Mediterranean Baked Trout with Fennel Salad: Fennel, trout, lemon and capers make this one spectacular fish dish. Soups are an easy way to minimize your time in the kitchen and maximize time with family and friends. Make double portions of your soups so you can serve them for lunch and dinner throughout the week. 61. Easy Zucchini Soup Recipe:This soup gets its creaminess not from milk or nut milk, but rather it is a delicious blend of zucchinis and potatoes. 62. Chilled Cucumber Melon Soup: If you&apos;re lucky enough to live in a warm climate, take advantage of the weather by enjoying this chilled soup. Try serving it for lunch or dinner with a side salad and fish. 63. Creamy Potato Leek Soup: Make this soup either dairy or parve by substituting the cream cheese for with your favorite coconut or nut milk. 64. Creamy Roasted Garlic and Potato Soup: This creamy soup is perfect for Passover or all year round. Make this soup parve by using coconut milk instead of cream cheese. If you don&apos;t eat garlic on Passover, try caramelizing onions instead and mixing both sweet and white potatoes. 65. 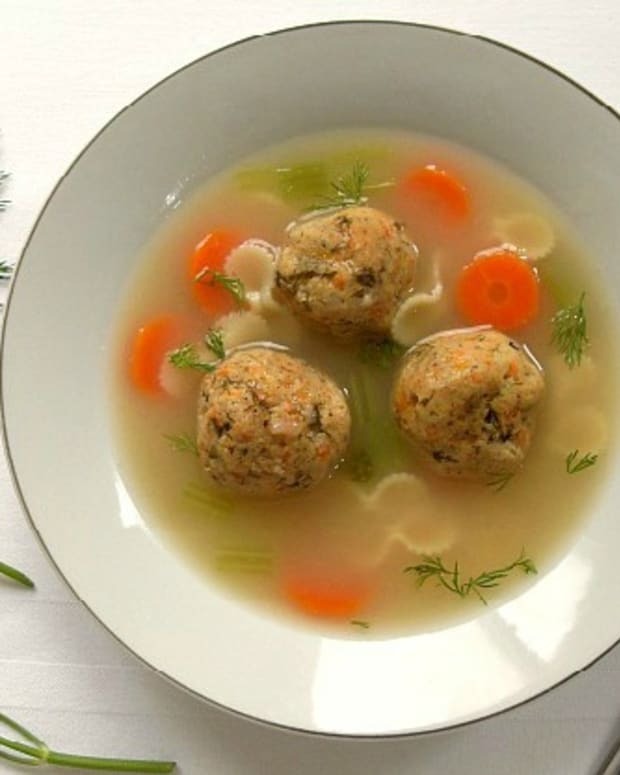 Passover Matzo Balls: The trick to these light and fluffy matzo balls is seltzer and olive oil! 66. Slow Cooked Short Rib Stew:Whether or not you consider stew to be soup, this stew is a show-stopper. Make it a meal by serving it with salad and roasted vegetables, and if you&apos;re Sephardic enjoy it with rice! 67. Fish Soup: Making your own stocks and soups gives you the freedom to experiment with flavors. This fish soup is delicious in it&apos;s own right, but could also be saved to use as stock in other fish dishes. 68. Passover Parsnip and Celery Root Soup: If your custom is to peel all vegetables during Passover, then this is a great soup for you. This rich velvety soup gets some of its creaminess from Temp Tee cream cheese, but for a parve version omit the cream cheese and add white potatoes instead. 69. 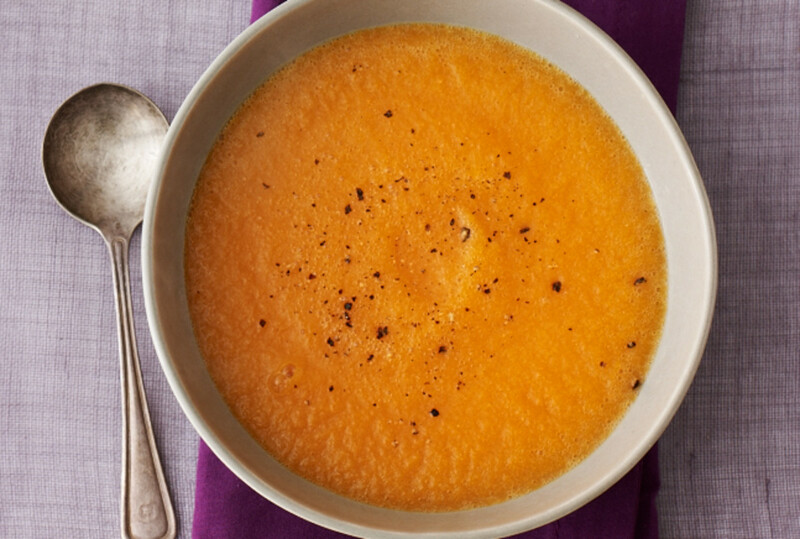 Carrot, Orange and Ginger Soup: This soup is pleasing to the eye and brings a splash of color to the table, not to mention the rich and savory flavors at play. 70. Passover Creamy Cucumber Gazpacho: I wasn&apos;t always a fan of cold soups, but once the dairy component was introduced I started to understand why people enjoy gazpacho. The cucumber and cream cheese compliment each other making this a delightful dish. During the year I try to limit my weekly red meat consumption, but on Passover I give myself the green light to indulge a bit by preparing a few of my favorite meat recipes including brisket and roasts. 71. Brisket with Barbecue Sauce:Besides the amazing flavor, I&apos;m a big brisket fan because it slowly cooks itself to perfection leaving you to enjoy your holiday, outside of the kitchen! 72. French Roast:The french cut roast is a very elegant dish which is sure to impress your guests. It&apos;s a great option for shabbos or a nice way to maintain the holiday spirit during chol ha&apos;moed, the interim days. 73. 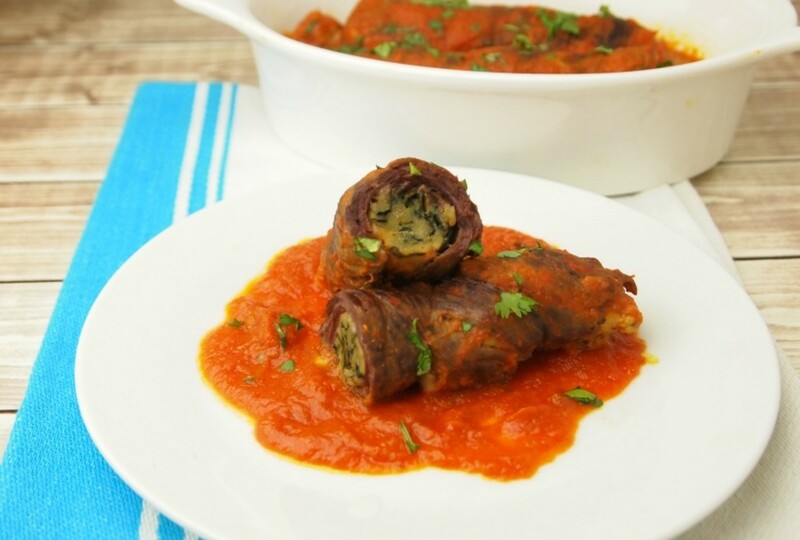 Kosher Braciole Rolled Steak: These are more than just your average roll-ups! Adjust the vegetable filling based on your preference and if you don&apos;t eat gebrokts, substitute the matzoh meal for potato starch or finely ground almonds. 74. Grilled Skirt Steak with Almond Sauce: I&apos;ve always been a little nervous about cooking skirt steak, but this recipe is a quick, fool-proof way to cook a perfectly tender and delicious cut of skirt steak. 75. Pomegranate Glazed Asado: A fusion dish inspired by the South American asado and the pomegranate of the Middle East, this would be a great option for shabbat dinner during Passover. 76. Beef Carpaccio with Tomato Vinaigrette: The thinly sliced pieces of beef make this an elegant dish to serve for lunch during the holiday. 77. Grilled Steaks with Chimichurri: Chimichurri is a an Argentinian sauce composed of a mix of herbs. Depending on which herbs you use on Passover, mix and match them until you reach your preferred flavor profile. 78. 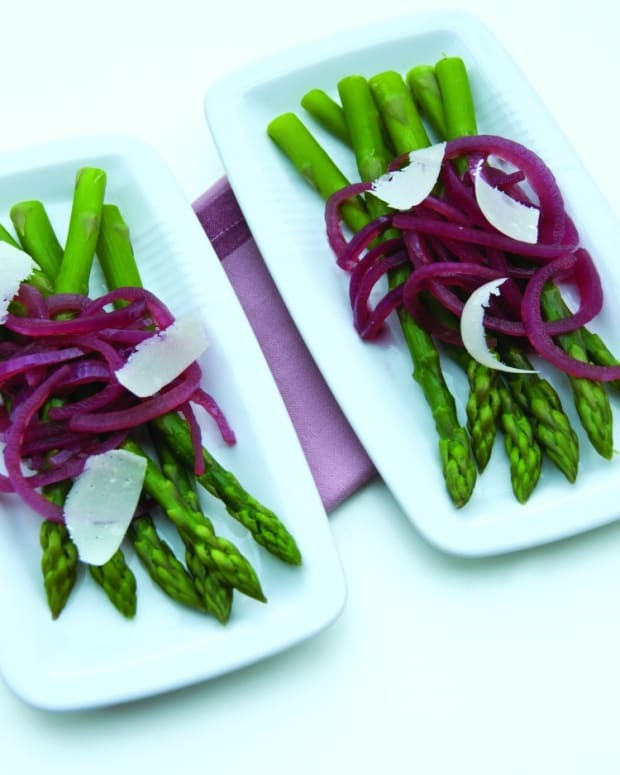 Lamb Bacon Wrapped Asparagus: Planning a Passover Picnic? Consider packing these lamb bacon wrapped asparagus as a salty, satisfying dish. 79. Braised Lamb Chops: Treat your family to these braised, fall-off-the-bone lamb chops. 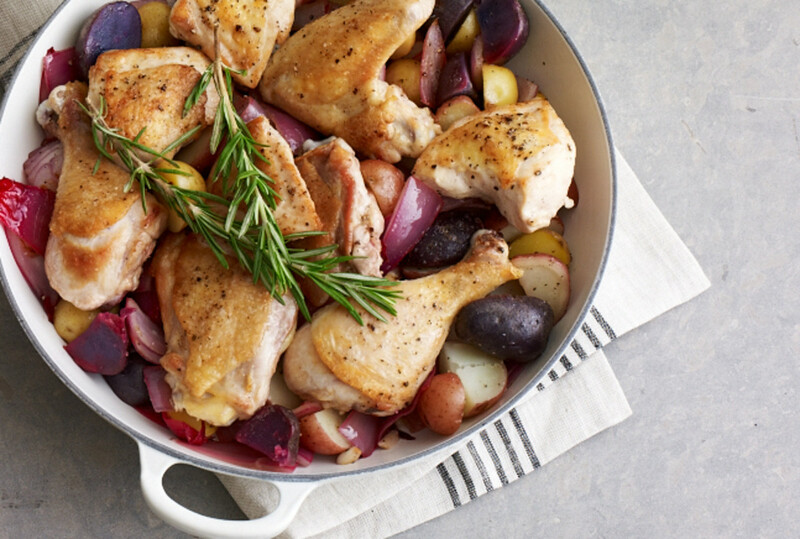 This simple, perfect for Passover recipe is composed of fresh herbs, onion and wine. 80. Beef Back Ribs with Vinegar Based BBQ Sauce: No need to haul out a grill, these ribs can be made inside! The easily transformable flavors of poultry make it a great fleishig, meat, option during Passover. Renew your appreciation of poultry by trying some of these classic and reinvented dishes. 81. Chicken Baked with Babaganoush: I love chicken and I love babagnoush, but I would never have thought to bake them together! Prepare yourself for an adventure in flavor. 82. Smoked Turkey Rosti Latke:This is one of those ultimate-one-pan recipes. Nothing compares to the mixture of roasted turkey and fried potatoes in this exceptional turkey latke. 83. Classic Jewish Deli Chicken: With all that leftover chicken from the night before, why make a meal from scratch when you could have classic chicken salad ready in minutes. 84. Lemon Rosemary Roast Chicken and Potatoes: Lemon, rosemary and white wine are a classically delicious combination of flavors. Leave these in the oven to forget about them until the savory smells of perfectly roasted chicken draw you back into the kitchen. 85. Asian Chicken Wings: Chicken wings are easier to prepare than most people think. No need for a deep-fryer, just place these wings in the oven to broil. 86. Chicken Savoy: The vegetables compete for attention in this chicken savoy recipe. Peppers, potatoes and onions along with garlic and oregano combine to bring out a beautiful flavor in the chicken. 87. Thai Basil Ginger Chicken: An exciting entree for the seder or shabbos dinner, this exciting blend of thai, basil and ginger will delight your guests. 88. Orange Chicken: If you don&apos;t eat many processed foods or unpeeled vegetables on Passover, this is a great recipe for you. 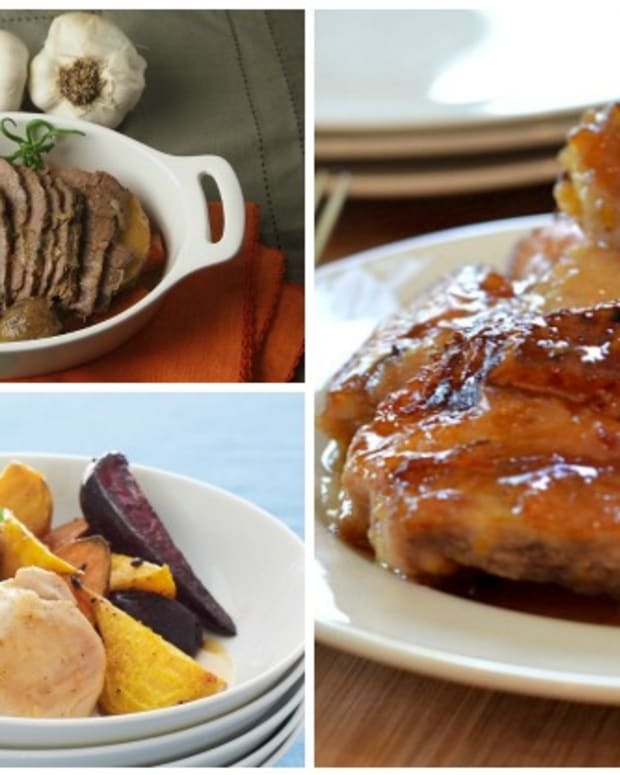 Sautéed onions and orange juice make a flavorful and delicious sauce for chicken. 89. Date Glazed Roast Chicken: Dates, garlic, citrus and vinegar create a sweet and savory flavor profile for whole roasted or pieced chicken. 90. Spatchcocked Turkey: I&apos;m not sure of the origins of name, but despite the funny name the flavors of this turkey are no joke. A simple combination of herbs such as thyme, rosemary, parsley and vegetables like onions, carrots, celery ribs are part of this tender, turkey dish. 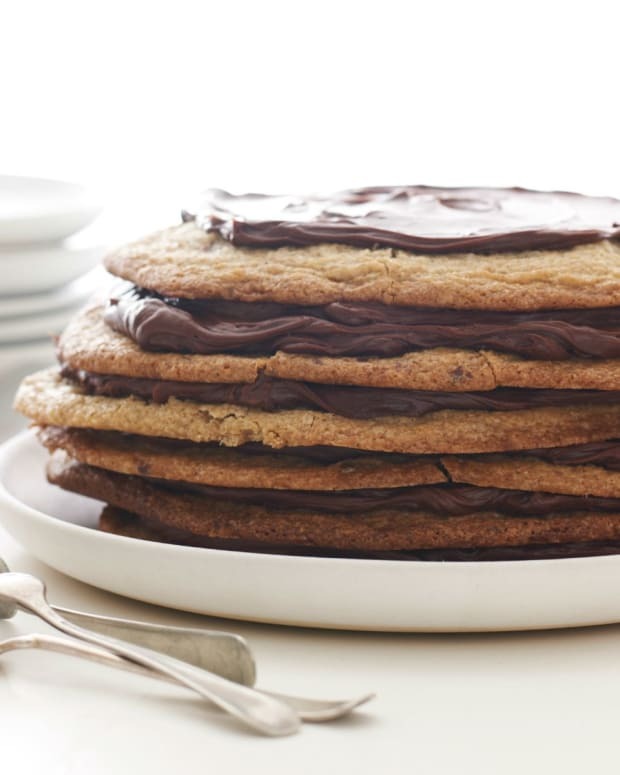 Desserts don&apos;t have to be boring just because it&apos;s Passover! Gebrokts or non-gebrokts there are plenty of sweet ways to end a meal or satisfy that sweet tooth with a delightful snack. 91. Mango Peach Basil Popsicle: This Passover popsicle is all grown-up. The basil is a tangy pop in contrast to the sweet mango and peach. 92. Chocolate Bark: Customize your chocolate bark by adding different combinations of dried fruit and nuts and you can use milk, white, or dark chocolate to please everyone. 93. Italian Meringue Coffee Dacquoise: This elegant dessert is sure to wow your guests. Make it dairy or parve by substituting margarine for butter. 94. Pavlova with Greek Yogurt:Reinvent this traditional meringue dessert by using greek yogurt as a filling. As an extra treat, top the meringues with an assortment of fresh fruit. 95. Raw Date Brownies: When I think of Passover brownies, the first thing that comes to mind is a box of processed potato starch and foreign sweeteners. These raw date brownies use natural ingredients and without stepping foot near the oven, you have a delicious dessert. 96. Four "C" Tart with Gluten-free Crust: The 4 C&apos;s, caramel, curry, coconut, and chocolate are a unique twist on the classic combination of chocolate and caramel. 97. Chocolate Dipped Fruit: Satisfy your sweet tooth without worrying about your waistline. Mix and match a range of colorful fruit to serve a beautiful and sweet dessert. 98. Apple Sorbet: This light, refreshing dessert is the perfect end to a yom tov meal. 99. Low-Fat Lemon Cheesecake: Enjoy this light, kosher for Passover cheesecake. Minimize calories by using low-fat dairy and maximize flavor with lemon zest and juice. 100. Chocolate Avocado Mousse: This guilt-free recipe is sure to please. The creaminess of the avocado replaces high fat dairy, while the cocoa powder flavors this not-so-traditional chocolate mousse. 101. Raspberry Macaroons with Cream Cheese Filling: Ditch the famous boxes of traditional macaroons for these beautiful raspberry macaroons with cream cheese filling. They&apos;re a delight to look at and to eat. 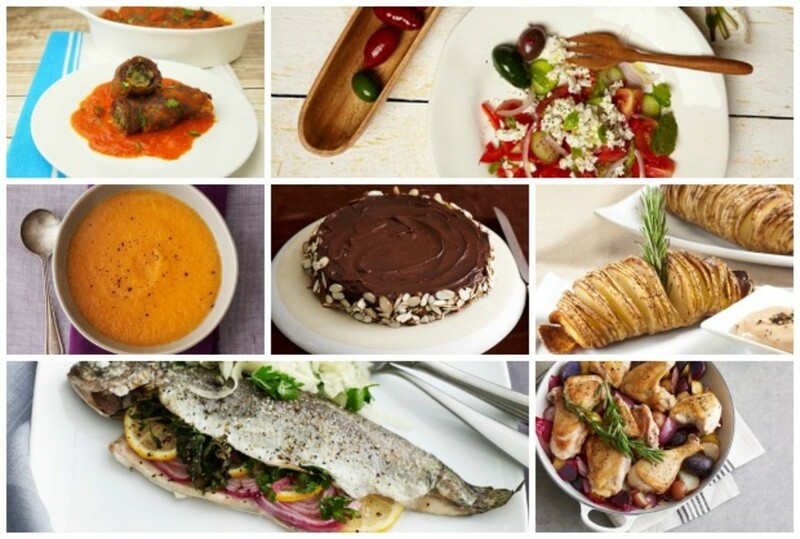 If you&apos;re looking for more ideas and inspiration, find hundreds of kosher for Passover recipes here.